Some "ISAN" personages are well known in and outside Thailand. 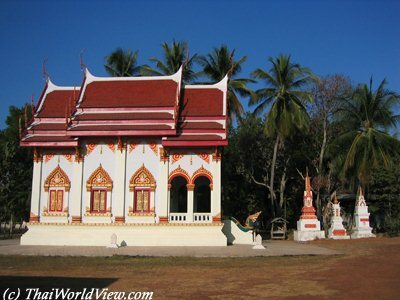 The monk Pra Prajak Kutajitto did protect with the help of the neighbouring villagers the forest of Hua Nam Pood in the province of Buriram. Despite the threat of the loggers and influential land speculators, he did declare the forest a meditation centre and a religious sanctuary. 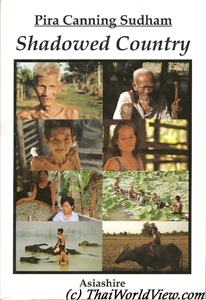 The Thai writer Pira Sudham is coming from a poor area near Buriram. Pira Sudham has been nominated for the literature Nobel Prize. When Pira Sudham was young, his family didn't have enough money to take care of him so they sent him as a novice in a Bangkok temple. When he grew up he had the chance to win a prize and went to study in New Zealand. There he wrote books about Isan area. He now lives back in a village and with the royalties of his books helps the poor people of his area. The Thai writer Kampoon Boontawee has won Thailand's first SEAWrite Award in 1979 with the book "A Child of the Northeast" ("LUK ISAN" - ลูกอีสาน). He is still writing books about Isan. 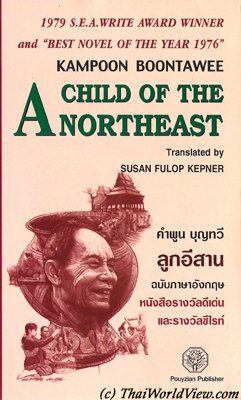 A movie based on his book "A Child of the Northeast" ("LUK ISAN" - ลูกอีสาน) was shot in year 1982. 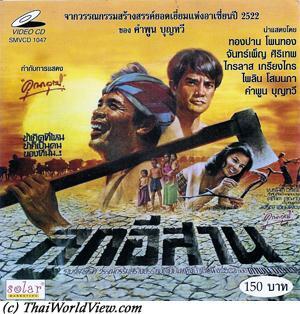 The film is shot in Lao language. It shows the harsh life of Isan farmers. Some villagers are leaving the area due to drought. Remaining villagers have to quest for water every day. Raining is not coming so a cat ceremony is organized. Water is thrown to an encaged cat in order that his shouts make the rain deity to take pity on him. 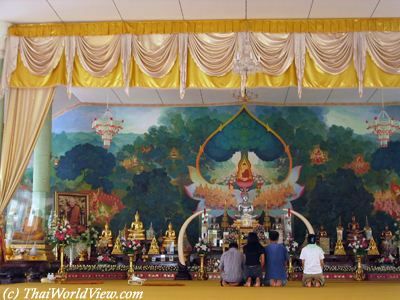 Monks are the advisors of the communauty and children go to schools located inside temples. Village shops are held by Vietnamese and Chinese people who argue together to sell goods to local people. Koon's family is setting up a caravan to go to the Mun river and stock fishes for a few months. Koon learns hunting skills from his father. Koon's cousin has to marry swiftly as her parents found she spent a whole night with one young man. Molam singers visit the village bringing joy and news from the outside world. An old woman is lamenting on her future as her husband is dead and her daughter only wishes to quit the village and its harsh life. General Chavalit is coming from Isan. He was prime minister when the Asia Crisis happened in 1997. In year 2001, he was defense minister. On this picture he is wearing the local Thai Farmers dark blue mens shirt (ม่อฮ่อม). 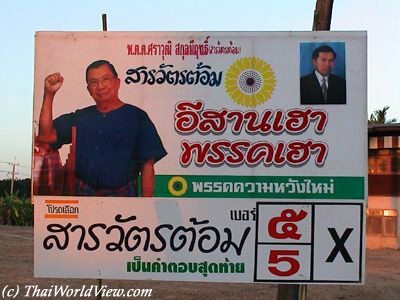 Isan is unfortunately well known for its vote buying. Candidates for nomination as villages or district head can spend large amount of money for their campaign. Then they need to regain this investment and secondly to increase their own gain so enjoying impunity and increasing wealth and power. Near Buriram, in Chamni District there is a Thai foundation that helps children from poor families to continue their study during two years. This foundation is called Khru Thim Bun-ing. Its name came from a teacher that has been shot after denouncing a bribery at the school construction of his village in Satuek District in 1978. This foundation also helps Thai farmers by making small loans to buy some land and this way they don't have to migrate to Bangkok to search for a job. When loan has been given back it can be used for other projects. As teacher and activist, Khru Thim fought hard to see that Isan children had more educational opportunities and more efficient educational programmes. A group of teachers in Isan, wanting to keep his ideology alive, established the Foundation in his memory in 1983. Local school teachers, Thim Bun-ing (Tim Booning) and Somjai Utrawichain have been murdered for exposing corruption in their provinces. The headmaster of Ban Hauy Kaew school in Hauy Kaew district of Chiang Mai was a conservation activist named Nid Chaiwanna. Similar to events in Isan region, Nid Chaiwanna was assassinated by a gunman following conflicts and violations over land and forests. The topic related to "Isan teachers killed by hired gunmen" has been successfully adapted to the cinema through the famous movie "The Rural Teacher" (ครูบ้านนอก).